It only started 15 days ago. I almost can’t believe it. A phenomenon that has taken my life by storm, that has occupied my every waking moment… it’s called The Lucky Ones. I first encountered it on Instagram. Put on by immersive theatre company Riptide, I was promised a pervasive experience that combined theatre, video games, escape rooms and podcasts into an adventure that can only be enjoyed one-at-a-time. I had no idea what to expect. Would people be coming up to me in the street? Would I be receiving secret messages to decode? Would it all be quite lame so I barely even realised it was going on? I knew that I couldn’t live not knowing. I accepted Riptide’s invitation to become one of The Lucky Ones. And here is my story. Warning – spoilers are below. If you’re currently taking part in Riptide’s The Lucky Ones, I’d suggest holding off on reading this until after the end of the month. And PLEASE don’t post any major spoilers in the comments, for my own sake. Another warning – this is a long one. I know The Lucky Ones was supposed to start on the 1st, but when I check my postbox there’s nothing there. I assume whatever I’m expecting has been held up by the snow. It’s arrived. I have no idea whether it really is part of The Lucky Ones, but a parcel has turned up in my letterbox, and it’s some beautiful flowers. Red, my favourite colour. Carnations and baby breath… I think, I’m not so hot on my flowers. And a note signed “L x”. This is my first clue of what to expect, and I’m stumped. Today I receive a few texts from L, asking if I liked the flowers. 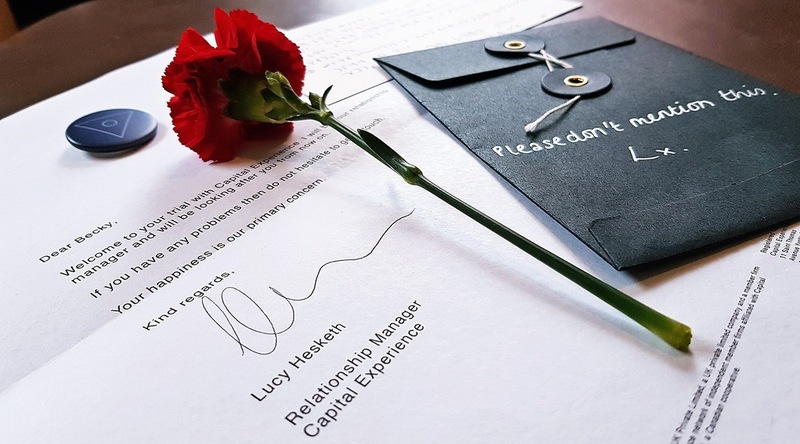 L turns out to be Lucy, my “Relationship Manager” from a company called Capital Experience. Her texts were peculiar – telling me my happiness is their primary concern. She’s cagey on giving me more details. Lucy’s texted again, and asked if we can arrange a time to meet. This is getting exciting. She says they have something to give me. Our rendezvous is set for Tuesday, 11am at Leeds Art Gallery. I try to continue on the conversation, but Lucy shuts it down. When I ask she says that premium members are selected based on behaviour. I text back two smiley faces. Already I can feel her manipulating me, but I’m desperate to get a premium account so I don’t care. Today’s the day. Running late, as usual, I race down the Headrow, and feel my phone buzz in my handbag. Fishing it out, it’s the instructions I felt sure I would be receiving – where to go, where to sit. I turn up with a minute or so to spare. Find the spot. Sit down. I peer at the faces around me – who could be meeting me? Will it be Lucy? Then I think that perhaps no one will be coming, but that they’ve left a parcel secreted for me somewhere around the bench. It’s while I’m inspecting the bench that a man walks up to me. He thrusts the parcel into my hand and walks off. I take a moment to gather myself before whipping out my phone to take a photo of his quickly retreating back. The clock is still striking eleven as I look down at the slightly lumpy package. There could be anything in here. My mind immediately goes to the worst case scenario. What if there’s a bomb or drugs or something? It’s ridiculous, but I can’t help it. Calming myself, I decide to retreat to the Tiled Cafe in the Art Gallery for a cup of coffee and some warmth. It takes all the self control I have to not rip the parcel open straight away. But I’m methodical. I find a table, take a sip of coffee. I unwind the fastening and remove the contents. The peculiar shape was down to four Lindor chocolates. My favourite. How did they know? There’s a few pieces of paper inside, and a second envelope which I set aside to look at later. The first piece of paper is a generic letterhead for Capital Experience. The address is somewhere in London, and the purpose of the company isn’t given away at all. A pin badge is attached with a strange symbol on – a circle within a triangle. I’d say it looked like a logo, but it didn’t appear on the letterhead. I immediately remove it and attach it to my handbag. Beneath this is a welcome letter for my “trial” with Capital Experience. The remaining two pages are numbered page 5 and 6, and seem to be from a script. Before I even start reading them, it’s like I know what they will contain. It’s the script I just acted out. A woman heads to a location. Sits down. She looks nervous, peering into strangers’ faces. Someone walks up to her. Meanwhile, my attention turns to the second envelope. It’s smaller and black, and warns me not to share this with anyone. I’m not sure if it’s an out-of-character instruction not to blog/insta about it or an in-game sneak action. Inside there is a postcard with an image of a red carnation on and a coded message on the reverse, as well as a tiny addressed and sealed envelope. I inspect the envelope first. It’s address to Max Westbrook, with a Leeds City Centre address. The back instructs me “Do not open. Send this now.”. I hesitate for a moment, then set the envelope aside. Immediately I spot how to decode the postcard. There’s a five letter word starting the postcard, and a four letter and one letter finishing it – surely “Becky” and “Lucy H”. When I finally sit down to crack it later that evening, it doesn’t take me long. I love cryptography. It’s Lucy x not Lucy H, but it’s still more than enough for me to solve it… except for one part. My mind whirred. Lucy was no longer around? Had they killed her? But she’s still contacting me? Perhaps she’s sent the code as preparation because she’s in danger, and only after I receive the key to cracking it will she be “not around any more”. But henceforth all my interactions with Lucy are done with the underlying thought of… is this the real Lucy? The undecipherable section seems to be a phone number, of the format 0aabc ddc0dc. I assume it begins either 077 or 0113… but there’s literally no way for me to crack this without a key. There’s no other numbers in the message I could use as reference, and with 378 different permutations there’s no way I’m trying them all. Oh, and the addressed envelope? I posted it… Nearly. I was literally stood next to the postbox, with it in my hand, and not a doubt that I would post it. I guessed that it might be intended for another participant in the game, and that I’d receive my own in a few days time. Images flashed in my head of the Black Mirror Episode “Shut Up and Dance”, and I half wondered what terrible thing I was sending on… As I reached towards the postbox, I glanced towards Sainsburys. It would be so easy to open the envelope, nip in, buy some pritt stick, glue it back down… no one would ever have to know. So I opened it. And I was so relieved I hadn’t sent it. It contained a note addressed to me, and complimented me on being “a leader, not a follower”. It was also from Lucy. Later that day, I do indeed receive an email. It’s (again) from Lucy, and I note that she is the only person I have had any contact with (besides mysterious mail man). It contains an audio clip, which I impatiently wait to listen to after work. The email suggests I sit down with a cup of coffee, but instead I listen while standing at the bus stop. You are probably wondering what is going on. Why this is happening? Why you? It’s a man’s voice. Probably not Lucy. You are here because there is something about life which doesn’t sit quite right for you. Something you can’t quite put your finger on. Something… wrong. You want to dive beneath the surface level of life, and really experience it to its fullest. I start to get Matrix flashbacks. Are they offering me the red pill or the blue pill? You have been chosen. You are one of the Lucky Ones…. TITLE DROP! The crowd goes wild! Right now, your life is about to change. You are the hero in your own story. Whatever happened before this moment does not define who you are. You have learnt lessons from your past, but you are not your past. You are the person in this moment listening to this. Your story begins right now. What would the hero of your story do if this was the opening chapter? Do that. Go on from this moment and live your life how your hero would. We will be with you every step of the way. We will be in touch again soon. After a long long long day of more and more clues, I go to bed, mind a-buzz with ideas. After a busy day yesterday, I’m assuming some radio silence while I digest, so I’m surprised when I receive this text from a completely different number. A quick poll of my Instagram followers seems to suggest that everyone’s in favour of me going for a drink at the Alchemist, but I don’t know how much of that is just because everyone thinks I need more cocktails. Today things got weird. I mean. Weirder than being given a package by someone I don’t know at a random location. Today I think Lucy started flirting with me – if it is indeed Lucy. I drop Lucy a quick cheery text, and receive three back. The first is a generic “Thanks for asking how I am, the sun is shining, how are you?” But then… When I pry more, I get the generic “more privileges are given to premium members” automated message. Meanwhile, my need for a fix has got me trawling social media, and I manage to speak to three different people who are involved with the Lucky Ones. All of our stories are slightly different. One received dark chocolate rather than Lindor (not her favourite). And another didn’t receive the letter to Max that you were supposed to post on. She also hadn’t received yesterday’s text from a different number, and Lucy wasn’t shutting her down in the texts the way she was with me. It seems that our minuscule differences in our interactions may have affected our paths more than we thought. Later, after a few cocktails to bolster my confidence, I drop by Max’s. I chicken out of knocking on the door – going to a strangers’ late at night on my own seems like a dumb move. But I make a resolution that I want to be a premium member, and since it’s measured by behaviour, I will do anything and everything possible to prove to Lucy that I am a happy person. The happiest damn person alive. It’s a busy day at work, but I manage to zap off a text to Lucy telling her how happy I am. Hours without a response go by, and I’m in despair, when finally my phone buzzes… with the auto-reply. I go to the Alchemist to drown my sorrows, but no one seems to recognise my badge. I check Twitter, and see someone else got a Bounty rather than Lindor. I consider going to the Lindor store. I eat the rest of the chocolates and scavenge the wrappers for hidden notes. I see on Instagram that Riptide have added a cryptic video to their story, and spend ages trying to work out what they’re saying. Someone points out that the Riptide profile has an address on it now that it didn’t have before. I screenshot it and add it to the list of potential locations to visit. After several hours spent clinging on to every scrappy idea that I could come up with… I realise I’ve missed some of the obvious clues. On the letterhead that I removed the badge from and dismissed. Firstly… the London HQ address is a ruse. It’s 404 Canada Square, and 404 is internet speak for Address Not Found. But I’d completely overlooked the actually useful information – the WEBSITE ADDRESS and PHONE NUMBER. Goddamnit. I check out the webpage, and it’s got a section for Premium members that’s password locked. And when I call the phone number, I’m prompted to leave a message. I leave the chirpiest damn message I’ve ever left, and go to bed feeling daft. So, my postbox is down on the ground floor, by an entrance we don’t use often, it can occasionally be several days between us checking for post. Not a mistake I’ll be making again. The letter is in the smaller black envelope that I recognise from Subversive-Lucy. The letter is written on Capital Experience headed paper, and gives me my first insight into what the purpose of the company. I’ve been watching you for a while. It’s my job. Not physically watching you, well, not always, but what you do online, what you like, what you don’t like. It’s what Capital Experience do. We make sure the world is as you’d want it to be, with the experiences you’d want to have, not just online, but in real life. I really think it’s you. It has to be you. I don’t know what has to be me. I don’t know and I don’t understand. That’s it. That’s the secret message to confirm we are talking to each other. I hastily dig out the letter so I can be word perfect in my response. I wait for a reply. It doesn’t come. I’m shocked that he knew who I was, for some reason. From a logical meta-game point of view, he presumably had my number saved. But I forget that for a moment, and it brings me deeper into the world of Capital Experience. My name is Max. I think you know me a little. I got your code. My fears evaporate. My letter was received. I realise that I’d half been worrying that the address was one that Capital Experience was using to spy on me. I had been worried that someone at CE HQ had been working on cracking the code, trying to out Lucy. I realise that whatever my fleeting thoughts were, I would never turn on Lucy. She’d sent me Lindor. She was my friend. The voice on the phone is friendly. Familiar. I think I’ve met him before. I think perhaps he gave me the parcel. No.. wait. It’s the voice from the audio clip. He works for Capital Experience too? The conversation seems to flash by. We need you to go to Lucy’s flat. We need you to get something for us from that flat. Me and Lucy, we can’t go, we’re being watched. I ask what’s happened, what’s happening, and Max is brief. Lucy has left Capital Experience, run away. They’re not what they seem. They’re spying on you. They’re spying on all of us. Honestly… that kind of seems to be how they seem. Right from the first package, the red flowers. The second package, with that peculiar script. Even before I received Subversive-Lucy’s letter, I knew they were watching me. You need to trust Lucy, and you need to trust me. I ask why. I don’t know the guy. He laughs, and tells me to trust Lucy then. A few minutes later, I receive a text details of where to meet him to get access to Lucy’s flat. Tomorrow evening. The Headrow. I don’t know Max. I don’t know if he’s leading me into a trap. I don’t know if cameras will be set up, watching my every move. But I know I’ll never get any answers if I don’t go. As of 14th March, the Riptide experience has been under a media blackout. So I can’t share the incredible details of what happened when I went to Lucy’s flat… but watch this space and you’ll be the first to know when I can. In the mean time, you can watch my Instagram mini-series by going to my profile (on mobile) and watching Highlights Riptide 1, Riptide 2 and Riptide 3 (and any more that I add). I was invited to take part in the Lucky Ones free of charge, but all opinions of mysterious packages and befuddling texts are my own. Here’s my full disclaimer.